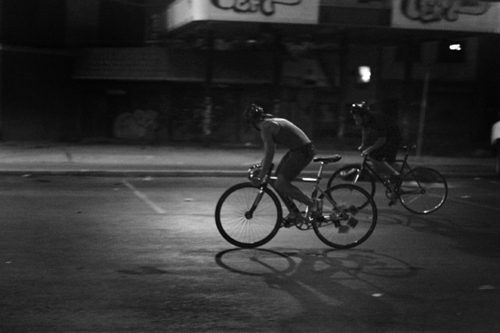 The Midnight Keirin Club is an informal bicycle street racing club. Meeting every other Friday, the club runs a variety of short format races from 200m drag races to 1 mile “alleycrits” circuits in secluded areas within NYC. Racers ride fixed gear brakeless bicycles and compete for bragging rights and occasional prize pots. This Friday, July 17, the Keirin club will be holding an alleycrit circuit at 1030pm in Greenpoint, Brooklyn. The course starts at McGuiness Blvd and Clay St. This week will be a 3 lap of a 1/3 of a mile circuit course. Gentleman’s stakes: no buy in, no prize pot, just bragging rights. Side wagering amongst racers encouraged.